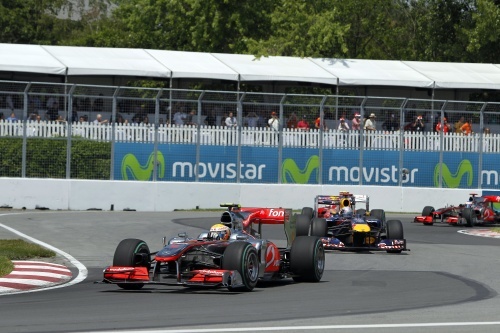 Formula One returned to North America over the weekend at The Circuit Gilles Villeneuve in Montreal. The race was missing from last year’s calendar but was reintroduced this year much to the delight of fans. As has become expected of Montreal, the circuit did not fail to entertain. The dramatic qualifying was followed by an even more eventful race in which tyre wear dominated the strategy and the lead swapped between several drivers as incidents and tactics played their part. In all the hiatus, it was Lewis Hamilton emerged victorious having driven superbly in the battle to manage tyre wear. His pace was consistent and his driving flawless as he eventually came out on top to record his second victory in succession. Lewis had a great battle with old rival and Honorary Member, Fernando Alonso, which almost resulted in a coming together in the pitlane. The result for McLaren echoed that of Turkey with a brilliant 1-2 finish as Jenson Button came home in second for McLaren after a patient and well paced race. Jenson, who is famed for looking after his tyres, put his smooth style into full effect and having been passed by fellow Member Mark Webber early on, he recovered well and was never far from the front. There will be disappointment for Mark as he led the race for a considerable amount of time before his tyres went away from him, eventually yielding to Lewis and Jenson, and finishing the race in 5th behind his teammate Sebastien Vettel. Fernando, was delighted that his Ferrari found form to finish 3rd; a great recovery after a disappointing weekend in Turkey. The Ferrari has seemingly progressed and Fernando showed what the car is capable of with quick race pace and the harassment of Lewis in which Fernando demonstrated he is still one of the best drivers in the sport. The results now mean that Lewis (109 points) and Jenson (106 points) sit 1st and 2nd respectively in the Drivers Championship. Mark is 3rd with just 9 points separating the top three. Fernando is 4th and still in the hunt on 94 points. McLaren have a firm grip on the Constructors’ Championship. The next round is Valencia for the European Grand Prix; a track which should suit the McLarens, so we await another thrilling development in this already exciting season.